Jr. NBA Philippines presented by Alaska is the league’s youth basketball participation program promoting healthy lifestyles and core values of the game at the grassroots level. Since 2007, the Jr. NBA Philippines program has expanded nationwide to reach more than 90,000 players and coaches, producing athletes primed to take Philippine hoops to greater heights and the hope of delivering the first homegrown talent to make it to the NBA. Nestled outside the heart of Makati City lies Chino Roces Avenue—a bustling street filled with car dealers, agencies and studios, sprinkled with bars and showrooms in between. From Edsa, Sirens and Bulb Studios are situated on the same block alongside Don Bosco Technical Institute, welcoming renowned local hoop stars Aljon Mariano, Kobe Paras, Kiefer and Thirdy Ravena, Ricci Rivero, and Kai Sotto with 2 Chainz’ “It’s a Vibe” playing on a warm August afternoon. Spectators feel it in the air that they’re in the midst of greatness as the vibe resonates with these six individuals looked upon as the future of Philippine basketball. Every once in a while, special players come out of nowhere to take the game into a different stratosphere. As the game integrates more high-octane offenses and evolves into a position-less exhibition, it then becomes natural for athletes to follow suit with progression. With access to a multitude of ways to learn basketball through clinics, personal trainers, or YouTube instructional videos, aspiring players are exposed to fundamental basketball training at an earlier age, which complements the development of more skilled athletes. Cast in the same mold are Kobe, Kiefer, Thirdy, and Kai who are the second coming of their fathers Benjie Paras, Bong Ravena, and Ervin Sotto—former stars from the 90s and early 2000s in the oldest professional basketball league in Asia—while Aljon and Ricci are at the onset of their own legacies. 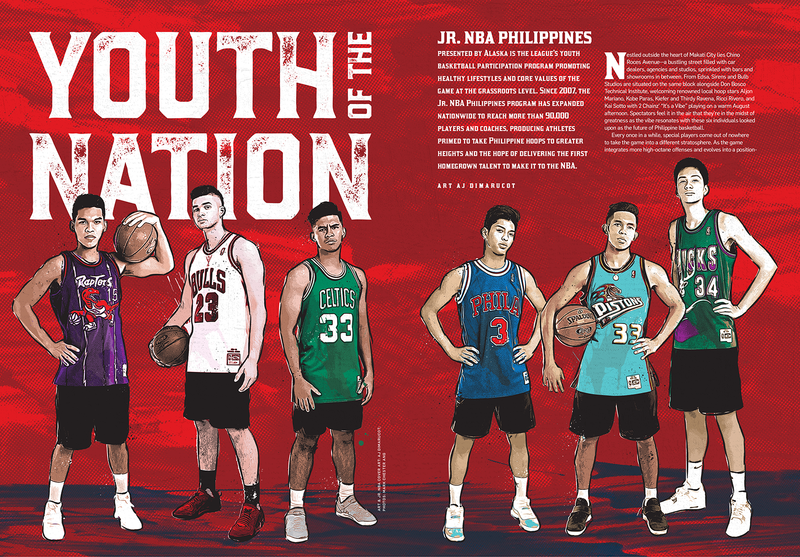 Defining the future calls for an assessment of the past, a looking back to where one is from, and all roads lead back to Jr. NBA Philippines—the NBA’s global youth basketball program for boys and girls—that had its pilot run in Metro Manila back in 2007. What started off as a tournament between the top talents of schools in Metro Manila has now transformed into a nationwide program divided into four phases—School Clinics and Coaches’ Clinics, Regional Selection Camps (RSC), a National Training Camp (NTC), and an NBA experience trip. School clinics and coaches’ clinics are staged independently while the RSCs transition their top participants into the NTC where they trained with current and former NBA and WNBA players through the years: Tina Thompson, Ruth Riley, Taj McWilliams-Franklin, Sue Wicks, B.J. Armstrong, A.C. Green, Luc Longley, Muggsy Bogues, Gordon Hayward, Nerlens Noel, Norris Cole, and Elfrid Payton. At the NTC, eight standout boys and eight girls are named Jr. NBA Philippines All-Stars, embarking on an all-expense paid trip abroad to engage with fellow Jr. NBA All-Stars from Southeast Asia and watch an NBA game live. Jr. NBA All-Stars have watched an NBA game live in various cities across China and the United States: Beijing in 2010 (Houston Rockets vs. New Jersey Nets) and 2014 (Brooklyn Nets vs. Sacramento Kings), Shanghai in 2012 (Miami Heat vs. L.A. Clippers), 2016 (Houston Rockets vs. New Orleans Pelicans) and 2017 (Golden State Warriors vs. Minnesota Timberwolves), and Shenzhen (Charlotte Hornets vs. L.A. Clippers); San Francisco in 2007 (Golden State Warriors vs. L.A. Clippers), New York in 2008-09 (New Jersey Nets vs. Charlotte Bobcats), and Los Angeles in 2013 (Los Angeles Lakers vs. Miami Heat). The NBA and Alaska Milk Corporation established its partnership in 2011 before becoming the program’s presenting partner in 2013. With this collaboration, the program expanded further with the inclusion of girls of the same age group within its camps in 2014. Since its inception, the program has grown exponentially, reaching more basketball aspirants year on year across the archipelago. It has impacted more than 90,000 students and coaches combined from over 700 schools across the country since 2007. The vision of Jr. NBA Philippines is to build a generation of boys and girls leading active and healthy lifestyles while enjoying the game of basketball. To achieve this, Jr. NBA Philippines established its first nationwide run in 2010, setting up RSCs in Metro Manila, Cebu, and Davao, and maintaining at least four major selection camps across key cities in Luzon (Baguio, Binan, Dagupan, Puerto Princesa), Visayas (Bacolod, Cebu, Iloilo), and Mindanao (Cagayan De Oro, Davao, Surigao) thereafter. In the process, Jr. NBA Philippines introduced the Train the Trainers program that equipped coaches with the proper training to conduct Jr. NBA-sanctioned camps to far-flung areas around the country in 2014. Through this initiative, Jr. NBA clinics have been successfully implemented in 110 cities and municipalities across 15 regions (NCR, Regions I, III, IV-A, IV-B, V, VI, VII, VIII, X, XI, XII, XIII, CAR and ARMM). In addition, the program now boasts 110 Jr. NBA Philippines All-Stars to date comprised of 87 boys and 23 girls, recognizing outstanding athletes all the way from Bacolod (Kib Montalbo), Cebu (Janjan Jaboneta and Dawn Ochea), and Davao (Miguel Competente and Mahloney Tarranza). During the Jr. NBA season, the NBA also worked with Boys Town, Children’s Hour, World Vision, and International Care Ministries among other institutions with provincial ties for its NBA Cares initiatives since 2010, conducting various activities including basketball clinics, tree planting, river cleanups, orphanage visits, and classroom refurbishment. In 2017, the Jr. NBA revitalized the indoor court of Polytechnic University of the Philippines College of Engineering that now provides families in nearby communities a safe avenue to hoop. After experiencing tremendous growth in the Philippines, the NBA decided to extend its reach across Southeast Asia by partnering with Alaska’s parent company Friesland Campina and Sport Singapore. As a result, the Jr. NBA program expanded to Indonesia, Malaysia, Thailand, and Vietnam in 2014, and Singapore in 2016—a testament to its longevity and success in impacting the lives of the youth. Celebrating its 10th year anniversary in 2017, Jr. NBA Philippines has reached the point where its athletes have matured, developed, and are now thriving in local professional leagues as well as local and international hoop circuits at the collegiate and high school levels. Among the notable alumni is Aljon Mariano, a member of the first batch of Jr. NBA All-Stars, who was chosen by the Ginebra Gin Kings (now Barangay Ginebra San Miguel) in the 2015 PBA Draft to become the first ever Jr. NBA All-Star alumni to join the professional ranks. Fellow Jr. NBA batchmate Kiefer Ravena would play for Alab Pilipinas in the Asean Basketball League in 2017 after graduating from Ateneo and also become the only Filipino player to win four Southeast Asian (SEA) Games gold medals. Meanwhile, Thirdy Ravena (2011), Ricci Rivero (2013), and Kai Sotto (2016) are making their mark in the Seniors and Juniors division of the University Athletic Association of the Philippines (UAAP). Internationally, Kobe Paras (2011) is set to play for the Cal State Northridge Matadors in the U.S. National Collegiate Athletic Association (NCAA) upon completing his redshirt status this year. The UAAP and the NCAA feature a host of former Jr. NBA All-Stars. 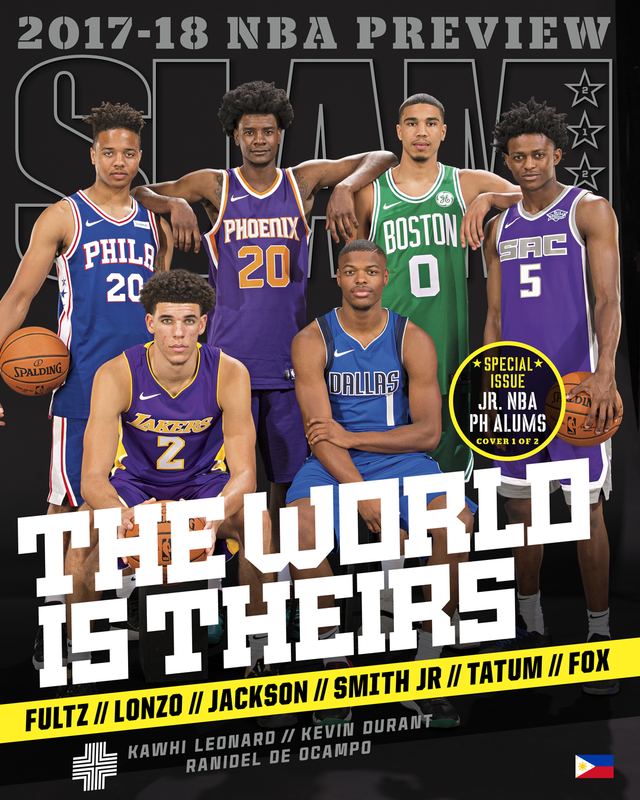 From the UAAP alone, Jr. NBA Philippines alumni are well represented by Adamson University’s Dawn Ochea, Ateneo de Manila’s Thirdy Ravena, Tyler Tio, Gian Mamuyac, Marco Sario (Srs Team B), S.J. Belangel (Jrs) and Kai Sotto (Jrs), De La Salle University’s head coach Aldin Ayo (Jr. NBA Coach of the Year), Kib Montalbo, Ricci Rivero and Aljun Melecio, Far Eastern University’s Hubert Cani, National University’s Rhayyan Amsali (Jrs), Kenji Duremdes (Jrs), Joachim Laure (Jrs) and Paul Manalang (Jrs), University of Sto. Tomas’ Carlo Escalambre, Vince Dolendo (Jrs), and Cy Narvasa (Jrs), and University of the Philippines’ Jarrell Lim and Janjan Jaboneta. At the same time, there are a handful of NCAA players who were once Jr. NBA All-Stars including De La Salle-College of Saint Benilde’s Luigi Velasco, Emilio Aguinaldo College’s Ichie Altamirano, San Beda’s Sam Abuhijleh, and San Sebastian’s Patrick Ramirez, Regille Kent Ilagan and Lorenzo Navarro. Measuring the worth of the Jr. NBA lies not in the number of participants and cities that accumulate each year, but in these high character individuals who have emerged as its finest success stories. What sets the Jr. NBA apart from other basketball programs in the country is the emphasis on S.T.A.R. values—abbreviated for Sportsmanship, Teamwork, Positive Attitude, and Respect—lessons that are applicable on the hardwood and in life. It’s no secret that basketball is the no. 1 sport in the Philippines with make-shift courts around every neighborhood, basketball jerseys an acceptable fashion statement, and year-round basketball programming available nationwide. In a country where basketball is a way of life, growing up in a family with a father known as a former PBA great sets expectations, warranted or unwarranted, for any son or daughter inheriting their genes and basketball acumen. 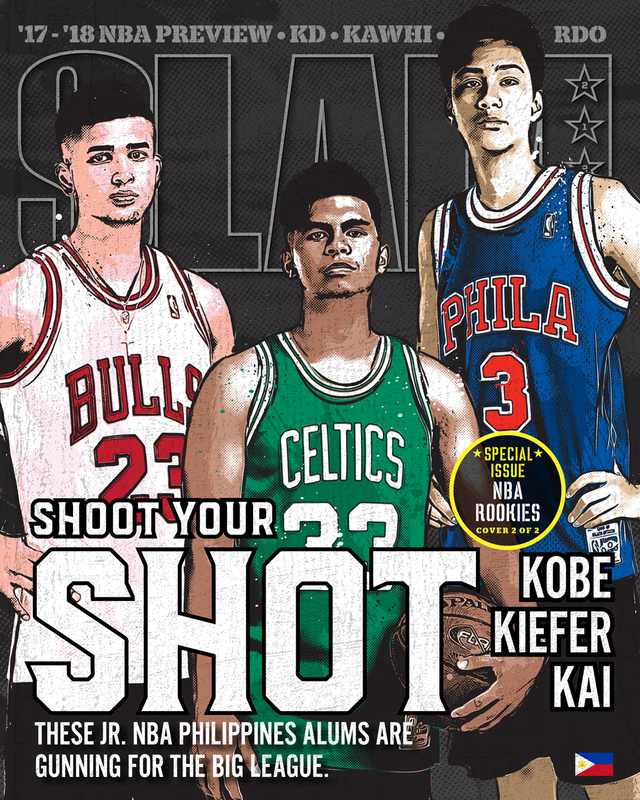 Embracing the opportunity to do the unthinkable are SLAM cover athletes Kiefer, Kobe, and Kai, all of whom reflect the next generation of Philippine hoops. 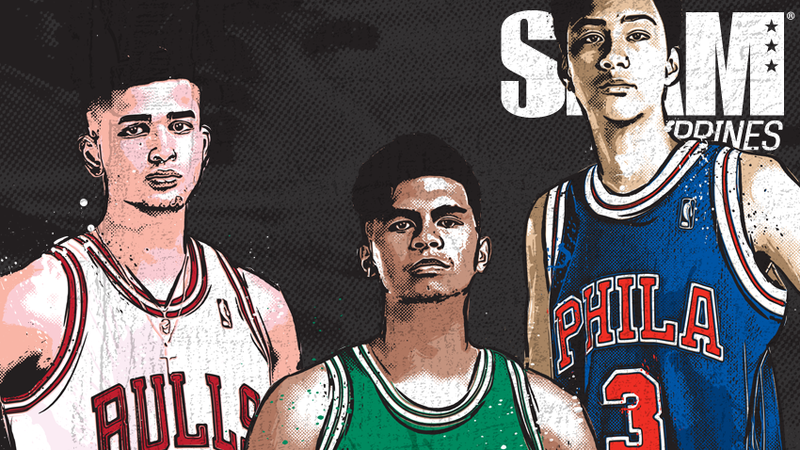 Invested in them are the hopes and aspirations of more than 100 million Filipinos to become the first of hopefully many homegrown athletes to make it in the NBA in this lifetime. But with the past NBA season setting a record 113 international players from a record 41 countries and territories on opening night, it might no longer be an impossible reality. Basketball aficionados are familiar with several members of the NBA family that have Filipino ties—Miami Heat head coach Erik Spoelstra to Los Angeles Lakers guard Jordan Clarkson who both have Filipino mothers—yet the association is not of the same magnitude as to having one of their own represent the country in the premier basketball league in the world. At present, Jr. NBA Philippines alums Kiefer, Kobe, and Kai are at different stages of their respective careers, traversing different paths towards the same destination. Kiefer, for one, has trained with the Texas Legends previously and now declared for the PBA Draft, but not closing the door on the NBA dream. Meanwhile, Kobe is back in the California grind under the tutelage of Cal State Matadors head coach Reggie Theus. Kai, on the other hand, is at the initial phase of his development as he masters a vast array of skills and grows into his 7’0” frame. Making it in the NBA requires a different level of focus, dedication, and sacrifice—possibly the greatest frontier they will ever face in their profession—but when you want something you’ve never had, you have to do something you’ve never done before. It’s only a matter of when, not if, until a Filipino breaks through but patience, understanding, and a little bit of luck remain essential to the process of letting these athletes walk their own journeys. And when that time comes, the hope is they realize that the Jr. NBA believed in them from the beginning, that the “Jr.” was never really meant to stay forever.